Hostinger - Why Should You Use It? Hostinger – Why Should You Use It? Web hosting refers to the process through which the organizations or individuals host their website or page on the internet. Only making a website is not enough, you need to publish it as well for your viewers to see it. Well for that you need a web server and a hosting site that will provide you with all the required features. When your viewer types your web address, the information from the server is transferred to the computer of the viewer. Hostinger is the leading web hosting service. It promises good quality at affordable rates. It offers several web features as well as a live chat support and works efficiently without burning a hole in your pocket. There are several kinds of hosting services. All this is possible due to the rapid advancement in technology. Hostinger has adopted the cloud hosting kind of web hosting process. You also need to have a domain name so that your website can be found on the internet. Try to pick a relevant domain name as it is the online address for your website. Hostinger has several plans regarding issuing a domain for your website. Hostinger makes web designing easy as well as smooth. You might be just starting out and may not know the coding. If this is the case, then you don’t have to worry at all. You just need to visit the website to solve all your problems. With cheap web hosting, Hostinger provides a drag and drop feature for you to decide what you want to include on your website. You just need to choose whatever you want and create your very own website after customizing it to your tastes and preferences. They have a user-friendly cPanel which will help you to save your time as well your energy. Professionals are always there to assist you in here. If you are new to creating a website, you will get plenty of room to learn as well as get a 24/7 assistance. If you have any queries which are related to web hosting, you can get solutions from the support team that knows the various services, cPanel as well as the cloud- system inside-out. There are several tutorials present on Hostinger.com regarding web hosting as well as technical knowledge regarding websites. Whether it is speeding up WordPress or getting access to the cheat sheet, Hostinger has a tutorial for all such actions. Even though phone support is not yet provided, they have live chat support, and they can speak to you in a lot of languages. You can also issue online tickets if you have any queries. The speed of your website determines the success rate of your website. No viewer wants a slow website which would cost them a lot of hours. Hostinger is based on a cloud infrastructure which makes your website load a lot faster. It provides Xeon processors, 24 GB RAM, and the latest SSD disk drivers which increases the speed of your website rapidly. You can now control your billing information as well as hosting subscriptions as Hostinger is easy to use. Every hosting company has different layout and services, and Hostinger excels in this department. All the hosting services are accessible from a single package. Domain name is the web address for your website, and it is very crucial. Buying a domain name separately can be quite expensive. If you do so, you will be spending money recklessly. It’s better to upgrade to Premium and Business Plans of Hostinger which provides a free domain name. Even though the basic plan includes only a free sub-domain, you can work and gain experience using this free plan. Later on, you can upgrade to the higher plan and expand the customer base of your website or webpage. 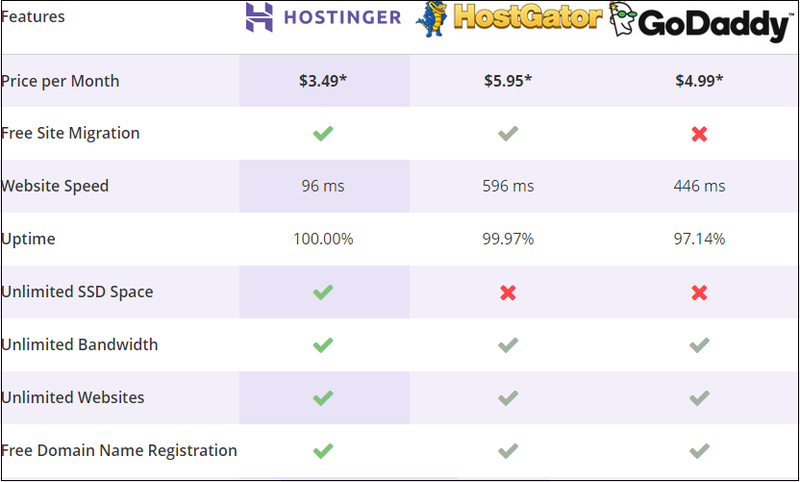 If you opt for the Premium Hosting Plan in Hostinger, it will cost you around $3.49 per month for about three years. This is a very reasonable deal and will not drain your funds quickly. There is no need for you to be worried regarding security problems as Hostinger issues SSL certificates for people who have chosen the business plan. The best part about this feature that there is no extra charged issue because of this. It provides world class web security as well as extreme website SEO. It will be a waste of time for you if your website has content which is good but still you can’t win against your competitors. This might be because your uptime is less than that of theirs. Hostinger provides 99% uptime. Even though the basic plan which is free of cost might not give you that, it has improved and advanced plans and even if you opt for the basic plans, you will get a good service. The team pledges to provide a good amount of uptime for all the plans it provides. There are several plans which Hostinger provide. While the using the Business or Premium Plans might require some amount of money, there is a free basic plan as well. The lowest tier plan is a real bargain and is a favorite among a lot of customers. While the beginners can go for the basic plan which is free of cost, experienced people can opt for the higher plans which will provide them with new upgrades. 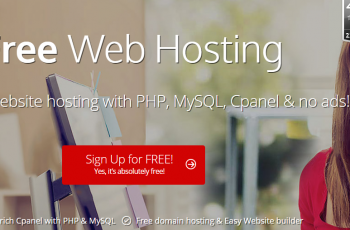 There are several other hosting companies in the market along with Hostinger. But Hostinger provides the best deals. Some companies do not allow free site migration, unlimited space, GIT support and other such necessities. But you won’t face such kind of a problem with Hostinger as it believes in satisfying its customer. Overall, Hostinger provides a good deal for everyone who is looking forward to starting their website. It appeals to the budget conscious website owners without decreasing the quality of the service they provide. They also ensure long-term hosting relationships and even have a 30- day payback policy for its customers.